WHO Is Making Changes To Fight The Next Pandemic, But Critics Say It Isn't Going Far EnoughIs : Goats and Soda The health agency is making changes so it can get boots on the ground if a pandemic strikes. But critics say it hasn't gone far enough. 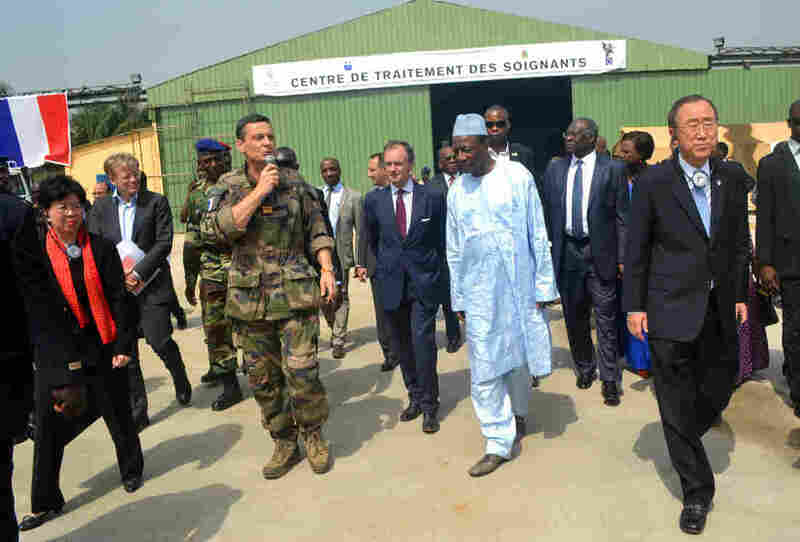 Margaret Chan (left), director general of the World Health Organization, is among the dignitaries visiting a military base in Conakry, Guinea, on a tour of west African countries affected by Ebola. Also pictured: Guinean President Alpha Conde (fourth from right) and U.N. Secretary General Ban Ki-Moon (right). The world is not ready for the next big pandemic. That's what health officials have been saying for years. If a deadly flu strain spreads around the globe, we could be in trouble. This week the health leaders are trying to change that. They're gathering in Geneva for the World Health Organization's annual meeting, the 69th World Health Assembly. At the top of the agenda: reshaping WHO into an agency that can take action during a health emergency instead of just giving out advice. For the past decade or so, WHO has been crippled, says Lawrence Gostin, a professor of global health law at Georgetown Law. The agency slashed its budget for emergencies, got rid of many experts and essentially became known for giving out advice instead of taking action. Then Ebola hit West Africa. Last year, he says, the agency took a big step: It started to build up its capacity to get boots on the ground — quickly — when an outbreak hits. "That's never happened in the past," he says. "They never actually got their hands dirty on the ground in the country." WHO is creating a team devoted exclusively to handling health emergencies, such as Zika in Latin America or yellow fever in Angola. In the past, the agency has had to rebuild this team from scratch every time an epidemic cropped up. "I've been with WHO for over 25 years and I've never seen anything like this," says Peter Graaff, the group's director of emergency operations. "It's really a completely new way of doing business." WHO has also started training medical teams around the world. The members will drop whatever they're doing and rush to an outbreak. So far, teams in China, Europe and Latin America are part of the program. "It will offer a much faster, more predictable response to health emergencies," Graaff says. Others say these reforms don't go far enough. "I think it's not even close," says Dr. Ashish Jha, director of the Harvard Global Health Institute. "What they've done so far, I don't believe begins to fix the underlying problem, which was much more about culture and openness and a sense of accountability." So much of what happens at WHO happens in secrecy, Jha says. There's little transparency — exactly the opposite of what's needed when a deadly disease is spreading, he says. Countries need to who is making decisions and why. Then there's the money problem. WHO is asking countries for about $500 million to fund the program. But the money hasn't yet been donated. "Even if that were fully allocated [from existing budgets], and the assembly hasn't done that yet, it would be woefully too little," Georgetown's Gostin says. By comparison, U.S. health officials asked Congress for nearly $2 billion just to fight Zika here in the States. "So I would say the World Health Assembly has to put its money where its mouth is, or else this could be a paper tiger," says Gostin — and he believes it could crumble if another crisis, like Ebola, strikes the world.